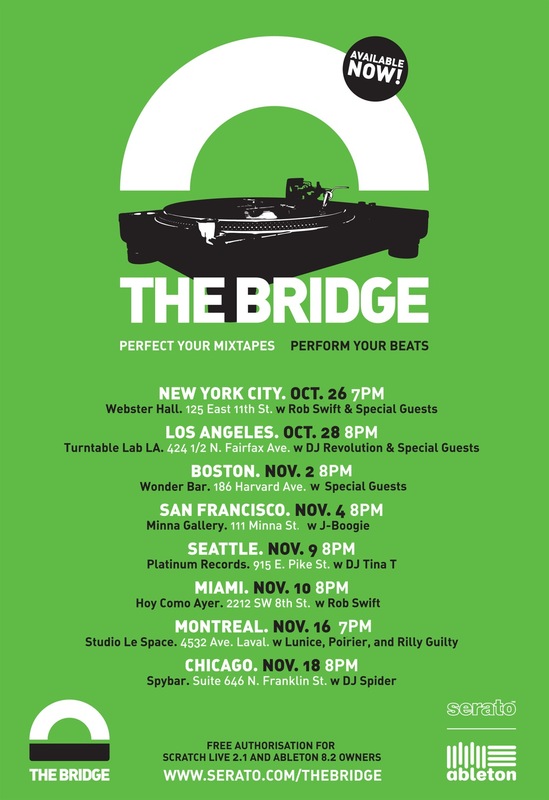 Tomorrow, October 26th, Ableton and Serato will kick off The Bridge Tour 2010, a series of events taking place in several North American cities that will celebrate the official release of the co-developed DJ/producer program The Bridge. The celebration starts here in NYC tomorrow at Webster Hall with the incredible Rob Swift of the legendary X-Ecutioners, Dubspot Instructor DJ JP Solis, and special guests. Other stops include Los Angeles, San Fransisco, Miami, and Montreal with topnotch DJs and producers including Poirier and Lunice in Montreal, and DJ Revolution and DJ Spider in Los Angeles. The Bridge Tour will travel to 8 cities in North America with product demonstrations to showcase The Bridge, the collaborative DJ/producer program co-developed by Ableton and Serato. Product specialists and clinicians will present the many diverse features of the program such as producing mixtapes and remixes, as well as performing live integrating both Serato Scratch Live and Ableton Live. Designed to capture real-world experiences, artists participating in the tour include Rob Swift, DJ Revolution, DJ Spider, DJ Tina T, Poirier, Lunice, and many more. Ableton and Serato present The Bridge — a natural link between Ableton Live and Serato Scratch Live. Ableton’s Jeff Milligan shows how The Bridge spans the gap between DJing and playing a live set, by allowing DJs to seamlessly integrate Ableton Live into a Serato Scratch Live setup. Great news. I saw a rather pedestrian demonstration of The Bridge at the BPM show in the UK earlier this month, and it is great. Can’t wait for them to release the Serato ITCH version so us controllerism fans can get our hands on it too without having to use dirty old record decks or CDJs.